The town of New Milford is located in the southern end of Litchfield County, CT, on the Housatonic River. It was one of the earliest settlements in what is now Litchfield County. European settlement of New Milford began in 1707, when one John Noble and his 8-year old daughter Sarah arrived from Westfield, MA, to settle. Subsequently, many settlers made their way up the Housatonic River from Milford (and from other places as well) to settle in this new town. The town's most famous offspring (although he was an adopted son, having moved from Massachusetts) was Roger Sherman, one of the authors of the Declaration of Independence. New Milford's children over the years moved west. Many moved to Connecticut's Western Reserve (Northern present-day Ohio), and their names are found in every state today. More recently, due to its proximity to Danbury and Interstate 84, as well as the Fairfield County "Gold Coast", New Milford has acquired two distinctly different characters. The still rural areas around the urban/suburban central area of New Milford has attracted weekenders, many from New York City, who have build elaborate estates. Meanwhile the central area has grown in terms of population, including those who are employed here and those who commute elsewhere. New Milford had a very credible brass band back in pre-Civil War days. It was so credible, in fact, that it was recruited in its entirety by the 4th Pennsylvania Cavalry as soon as the war started! One wonders what the reaction of the Connecticut authorities was when they discovered that this entire unit had been recruited out of state! One thinks of Danbury as Connecticut's historic hat manufacturing capital. We were interested to find that New Milford once was a contender for that distinction. New Milford had a Medal of Honor recipient in the Civil War (Corporal Charles H. Marsh, of Company D, 1st Cavalry). We published them a few years ago as part of a CD-ROM with that title. While that CD is no longer available, we have taken the contents and republished them as downloads exactly as they appeared on the CD. originally published in 1907 by the Grafton Press in New York City. Only 1000 copies of this volume were printed before the type was broken up. The paper on which the book was printed is not high quality, and we suspect that most copies are no longer in existence -- if they are, they will certainly not stand much handling at this point. Around 320 pages long, Two Centuries of New Milford contains several essays (roughly 135 pages) written at the time of the town's bicentennial, that serve both to recapitulate Orcutt's earlier History of New Milford and to bring it up to date. It also includes the bicentennial proceedings (roughly 165 pages), which, like the essays, are typically peppered with names and events. 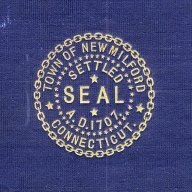 Also included are lists of New Milford people with military histories (including reconciliation between the official State of Connecticut list and Orcutt's list), lists of the hundreds of New Milford-related antiquities exhibited at the New Milford bicentennial (and, importantly, who loaned them) and even a list of New Milford people who lived to an advanced age. There is also a chronology of the history of New Milford covering the 200 years. There are 42 pages of photographs, mostly of people, many with multiple people pictured per page. The picture pages are glossy, and they have scanned extremely well. While the book contains an index, it is dramatically incomplete for today's uses. While it may have had some value at the time of original publication as a subject index, it omits the names of most of the people actually named in the book -- definitely making the original book of little use to people with a genealogical interest in the area. Thus, we decided almost immediately that republication should include complete re-indexing of the entire book, and are happy to provide our index here to permit examination before purchasing -- or for use with a copy of the book if you happen already to have one. to view the index. Download Two Centuries of New Milford, including our own index, in PDF format, for $5. This soft-covered volume consists of 40 un-numbered pages, including many photographs and several pages of advertisements. With 59 graduates of New Milford High that year, and with the Depression still very much in evidence, it is unlikely that more than 200 copies were originally printed. Due to its soft cover, we doubt that more than a fraction of these survive. to view the New Milford HS 1937 yearbook index. Download the New Milford High School yearbook for 1937, including our own index, in PDF format, for $4. It was striking to us while we were in the process of indexing this yearbook, compiled only thirty years after the Bi-Centennial, how much New Milford had changed in the 30 years that elapsed between the two books. INTERESTED IN TALKING ABOUT NEW MILFORD HISTORY? When we republish material about a locality we customarily provide a moderated e-mail group for those who might want to discuss the history of that place. Well, New Milford certainly deserves its own discussion group!! You'll be on the list immediately! We're also pleased to recommend the New Milford Historical Society to you. They've got a great web site with lots more New Milford information you are sure to find useful. to visit them -- but don't forget to come back!! Are you interested in our other Litchfield County, CT offerings? to go to our page about Litchfield County, CT.
How about Lake Waramaug? From the Connecticut Quarterly, Volume III (1897). Litchfield County’s Lake Waramaug has long been recognized for its scenic beauty. Since there is only just so much one can write about a scenic lake, this short article also covers both New Preston and Marbledale, the two nearest communities. See our Litchfield County page.